I’m back from New York, happy to be home but a little sad to leave New York behind, and even sadder to have the sniffles, thanks to all the sneezing, coughing people on my planes. Next time I fly I’m wearing a mask. The flight to New York on Southwest was the only bummer part of the trip. My flight was supposed to have a quick stop in Chicago but no plane change. I sketched my instant coffee (in a tea bag!) and swizzle stick on my seat-back tray (above). 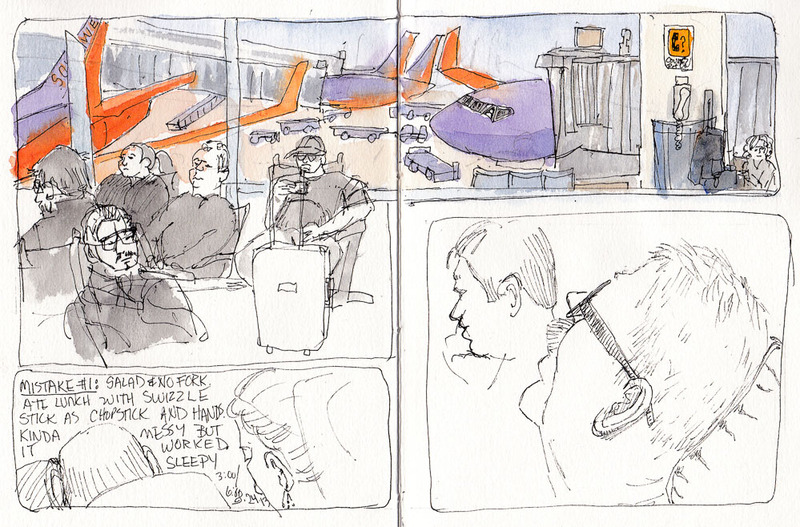 Later I added people waiting in the airport to the page. So there we sit on the Chicago runway with doors closed….and wait…and wait. The woman sitting next to me is sneezing and coughing. I ask her if she’s contagious and she says no, she’s been sick for days already (ugh). I was about to change seats when they announce there’s a problem with the plane and we have to return to the terminal while they find us another plane. Trying to be positive, I figure that’s better than flying with a bad plane, and now I have more time to draw. 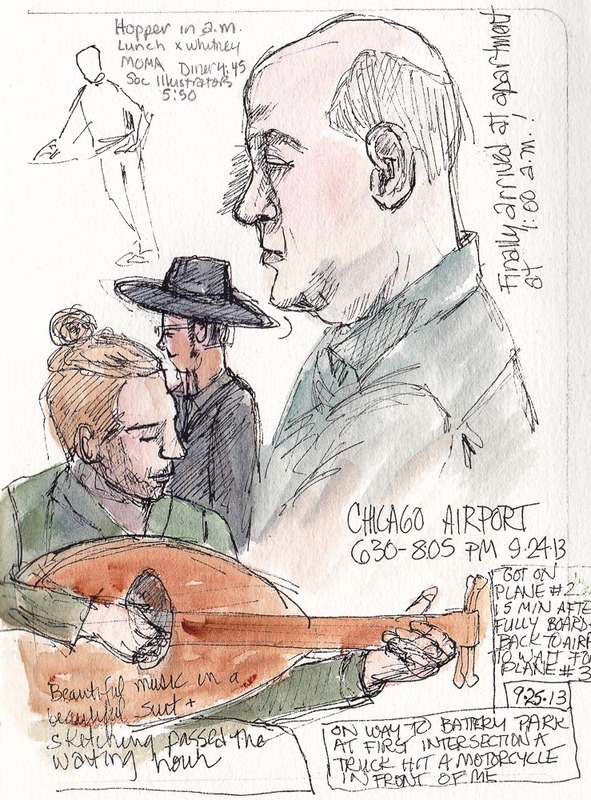 An elegant young man in a gray-green suit with his hair in a top knot played beautiful music on a lute while I sketched him and a Hasidic young father with his big hat and side curls. Finally Southwest instructed us to walk to the other end of the terminal to board our new plane. 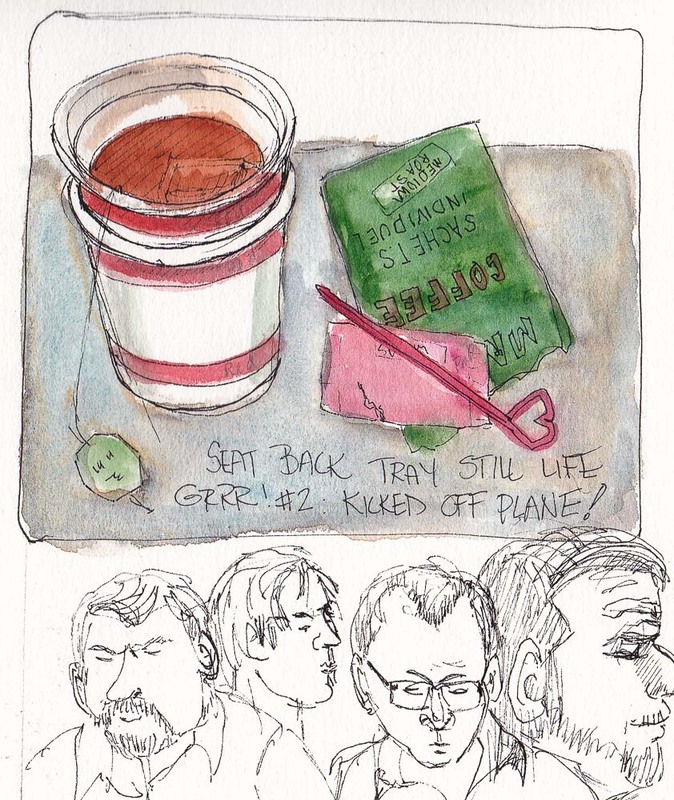 We hustled across the terminal, lined up, slowly boarded and crammed luggage in the overhead bins again. And then waited. Again. Southwest is known for being funny so I thought it was a joke when the flight attendant announced she was really sorry, but this plane also had a problem and we had to get off again and return to the terminal. But it wasn’t a joke. Back in the airport they said they would find another plane and bring it to us. Twenty minutes later they told us to walk back to our original gate at the other end of the terminal to board what was hopefully a different plane (or the original plane, now fixed?). It was 10:00 PM, the time we were supposed to be arriving in New York. That plane flew! Yay! I took a taxi from the dark, mostly closed Newark airport and arrived at the Upper West Side apartment I rented via AirBnB after 1:00 a.m. and went right to sleep. Nice sketches Jana! Sorry to hear about your flight adventure. Glad you eventually arrived. I’ll be waiting for your NY sketches! Just love the energy and movement in you sketches, Jana! Love your work. Looking forward to more! Thanks Troy! Lots more to come. Flying these days can be a quite an adventure! I am sorry you had such a rough start but glad to hear that was the only downside…and you did have lots of sketching time! From the experiences friends have shared with me about their air travel lately, I was prepared for misadventures and actually mine was minor compared to the stories I’ve heard. Oh my, what a saga! 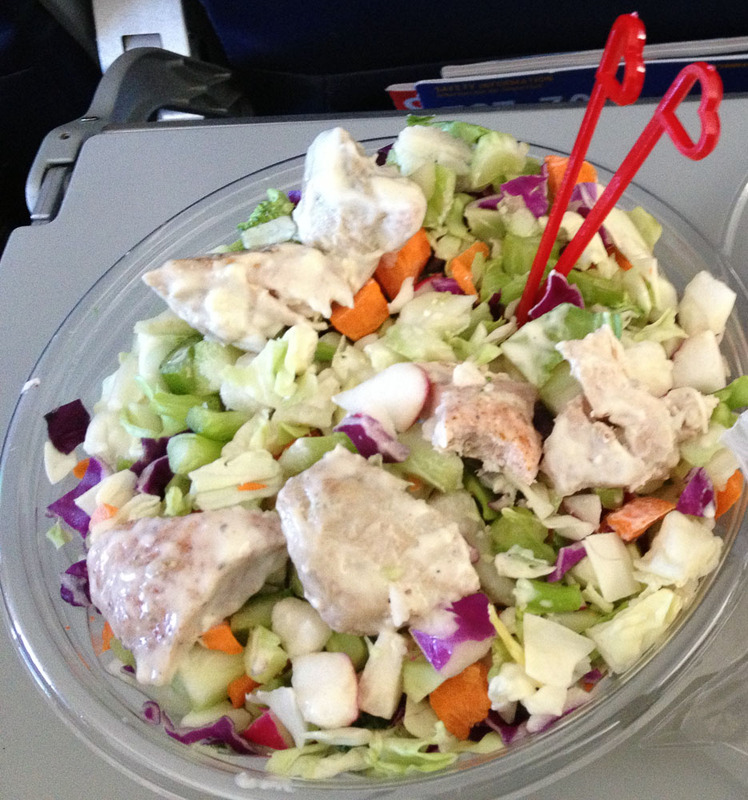 Sometimes flying seems like more work than it’s worth…Sorry you had a very long day. That is the advantage of always having your sketchbook with you. We just traveled to Chicago by train, which was mostly great, but as the trip went on we experienced more and more delays, finally arriving in Chicago 8 hours late. So I can relate to your story of arriving in the wee hours when you didn’t expect to. Looking forward to hearing more of your adventures. Years ago I took the train from California to Boston and we had the same experience of arriving hours late. We had to change to another train there and in their great wisdom, Amtrak held the other train in the station for us to board for about 5 hours. While they were in the station they couldn’t serve dinner to the passengers who were already on the train. Then when we got on, we got served dinner before the poor folks who’d been sitting in the station waiting because we had roomettes which gave us first class status. And the funny thing is that our tickets had been comped by Amtrak in response to an angry letter I wrote to them after my teenage sons took the train across country to visit their grandpa in Maine and Amtrak dumped them off in Washington DC, leaving them to fend for themselves for the night, after delays caused them to miss their connecting train. Oh, gosh, what a nightmare. But: you got there safely in the end. Love your scetches that really bring life to your story. The interesting thing for me about sketching while travelling is that it both engages me in my surroundings and yet, at the same time, distances me. This means that somehow I am present, yet observing from a distance at the same time. This makes makes it easier for me to cope, be present and enjoy the journey. That’s an interesting thought. I agree except I think what sketching distances me from is my internal dialogue, changing it from whining or complaining to noticing shapes and angles and pondering about the people I am drawing. That makes waiting time go faster and more pleasantly. Great sketches! Remind me never to travel with you! haha…glad you were able to meet Carol King. Must have been a special visit! Hi Jana, Work has been horrendous so I’m just getting around to the blogs. Sorry your flight experience was so messed up, but at least you got to sketch and draw (and I got to see them in person! Lucky me.) I’m glad you finally made the trip and the apt. you rented looked really nice. You got lucky with that.